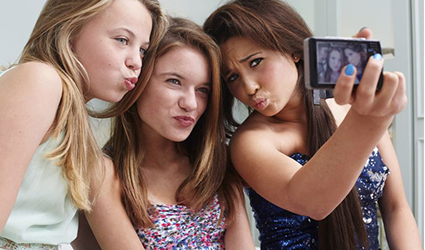 Are Selfies Harmful for Teens? Social media is becoming an increasingly more prevalent force in our daily lives, especially amongst teens and posting selfies has a major part of self-expression. But how has this influenced and changed behavior? A new study published in The Journal of Early Adolescence reported that teens who post more online selfies were more aware of their appearance, which is indirectly linked to an increased risk of negative body image. There are major vulnerabilities for the heavy utilizers of social media which include “picture imperfect” and “the click factor”. A Common Sense Media Report published in 2015 reported that teen girls experience great anxiety regarding the online presence and how they were perceived in the virtual world. When a photo is ignored, the teens become anxious and depressed followed by suicidal tendencies at times. Parents are advised to observe their obsession level between their physical image and selfies.